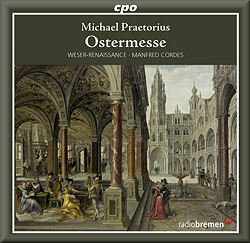 Michael Praetorius is best known for his Terpsichore (1612). In fact he was a much more prolific composer, with several hundred individual works to his credit, than the predominance of that often-anthologised work suggests. On the evidence of recordings much of Praetorius' music is of very high quality. Here is an example. The justly-renowned and respected specialist group is from Bremen in north Germany and is named after the Renaissance in and of that region. Weser-Renaissance performs Praetorius' Ostermesse (Easter Mass) under the dozen-and-a-half-strong group's energetic and highly knowledgeable director Manfred Cordes. The Ostermesse is a gentle work - which is fitting for the occasion; though it's neither lugubrious nor overly dark in timbre or tone. It's nevertheless dignified and appropriately glorious in impact. The Mass blends choral and solo text settings (in Latin) of the Proper for Easter; these are interspersed with Collects, Hymns and other seasonal numbers - often in German. The whole - 16 works in all - is supported by brass. Their playing, while resonant and subtly jubilant, is neither extrovert nor intrusive. The result is a striking, gentle and contained, yet restrainedly happy celebration appropriate to Eastertide. Each of these numbers is played within a relatively uniform span of tempi. This consistency, and hence the overall unfolding of the Mass, emphasises gravitas over joy. Cordes' conception of the work successfully conveys the latter as a direct concomitant of the former. This is reinforced by the precise yet unfussy articulation of the eight singers from Weser-Renaissance. The result is utterly confident and expressive. Listen to their unwavering and committed declamation of the Sequence, 'Victimae paschali laudes' [tr.5], for instance. In other circumstances this would be an outpouring. Here it's a controlled lament. It is a lament, to be sure; but it's one sung and played almost with delicacy - certainly laced with grace and respect. In this way we attend to the text for its meaning; yet none of the textual or musical poetry is lost. It's as though Cordes is leading his group through the process of declaring love, which in a way they and Praetorius are. They do so conscious of the rawness of such love at Easter and at the same time of the complexities of human love for a figure in such special circumstances as those of the crucifixion and resurrection. In other words, Cordes achieves a pleasant balance. It's a balance between the commitment, the involvement, of the performers as worshippers on the one hand and the turmoil of the early seventeenth century on the other. From this turmoil perhaps those for whom Praetorius wrote the music were distancing themselves. This understanding of what we may so easily imagine Praetorius wanted Easter to mean for those celebrating it with him is evidenced too in the control of phrasing, enunciation and breath of the high voices in the Evangelium, 'Erstanden is der heilige Christ' [tr.6] ('Christ is risen'). The performers convey an exultation and joy firmer and surer than any amount of 'mere' Hallelujahs. They seem to know that the event has lasting significance; that it hasn't been put into a musical setting only because that was a conventional trope. This is further reinforced by the plainsong passages of the Credo which follows. This balance, sense of proportion and resulting calm are other happy features of this performance of music otherwise unavailable on CD. The measured pace at which most of the relatively short numbers unfold - at two to five minutes for the most part - suggests certainty of, and an almost humble affiliation with, the Easter story. On the other hand, this performance never lacks zest or energy. The brass sees to that too: their tone is neither dry nor drowsy. Yet it stops short of too much plangency, or any histrionics. This ought to invite the sensitive ear to consider the liturgical complexity of Easter and ideally to marvel at Praetorius' skill in working with subtle feelings in genres which were already well-established, although they were also changing after the Reformation. The acoustic on this recording is neither unresponsive, nor disappointingly dry. It aptly supports our reception of every word and note yet lacks little in atmosphere. The booklet has useful background on the Reformation and impact on church and educational life. There’s also information on the composer, music and musicians with the full text in Latin and German - even if the font used throughout is really too small, especially for older or impaired eyes. If stately, confident and varied music from the German Renaissance appeals or if you want to explore Praetorius' work further, this is CD very well worth a look.